Diamond, platinum and eighteen karat gold bracelet by quintessential American innovator and jeweler David Webb ($37,500). 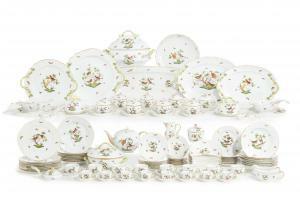 Extensive Herend Rothschild Bird pattern porcelain dinner service from the collection of Fima Ruchman ($50,750). Italian life-size carved Carrara marble figure of a Young Columbus by Giulio Monteverde (Italian, 1837-1917), done circa 1871 ($35,000). 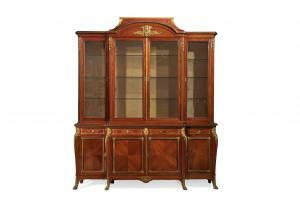 Impressive Louis XV style gilt bronze mounted mahogany vitrine cabinet from the late 19th century ($27,500). Screenprint in colors by Howard Hodgkin (British, 1932-2017), titled Indian Room (1966), numbered 3/10 ($7,500). The auction featured market fresh furniture, art, jewelry, silver, ceramics, decorative arts, carpets and design from prominent local collections and estates. DOWNTOWN LOS ANGELES, CA, UNITED STATES, March 8, 2019 /EINPresswire.com/ -- Andrew Jones Auctions’ first Design for the Home and Garden auction of the New Year, on Sunday, March 3rd, featured about 400 lots of market fresh fine furniture, art, jewelry, silver, ceramics, decorative arts, carpets and design from prominent local collections and estates. The sale achieved a 95 percent sell-through, grossing $1.1 million. The sale was held online (via Bidsquare.com, Invaluable.com and LiveAuctioneers.com), and in Andrew Jones Auctions’ spacious gallery, at 2221 South Main Street in downtown Los Angeles. 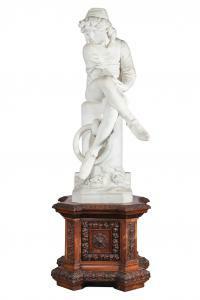 Previews were held on days leading up to auction, and phone and absentee bids were accepted. Fine jewelry by quintessential American innovator and jeweler David Webb1 produced sparkling results. A diamond, platinum and 18 karat gold bracelet shone to $37,500; a pair of matching diamond, blue enamel and gold bracelets that convert to a necklace realized $20,000; and a gorgeous sculptural diamond, platinum and 18 karat gold foliate brooch finished at $18,750. The decorative arts portion of the catalog included a Tiffany & Co.2 (N.Y.) Wave edge pattern part silver flatware service for twelve, which topped its presale estimate to fetch $6,250; a 36-piece King’s Husk pattern silver flatware set by Paul Storr dating to 1820 hit $4,250; and a German silver jardinière from J.D. Schleissner Söhne sold to a determined bidder for $4,000. A 42-lot run of an extensive Herend Rothschild3 Bird pattern porcelain dinner service from the collection of Fima Ruchman totaled $50,750, while a scarce, hand-painted Spode botanical porcelain dinner service from the collection of tastemaker Tom Buckley realized $4,000. An exquisite set of gilt and enameled Venetian glassware garnered much interest and made $5,000. Antique and modern furniture alike generated much buzz. A fine Louis XV style gilt bronze mounted vitrine cabinet from a Malibu collector garnered $27,500; a pair of French gilt bronze and parquetry bedside tables bearing the mark of Paul Sormani soared to $20,000; an unusual Art Nouveau carved and painted floor screen far surpassed its pre-auction estimate and achieved $8,125; and a Gilbert Rohde for Herman Miller Art Deco five-piece bedroom suite made $5,000. A dramatic Italian Baroque six-panel floor screen painting with a depiction of the Chariot of Poseidon earned $15,000. 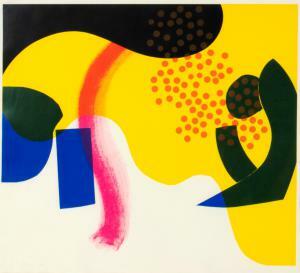 The top lot from a collection of British Modernist works from a Santa Barbara collector was a screen print by Howard Hodgkin, titled Indian Room (1966); it achieved $7,500. Czech Modernist Hugo Boettinger’s Nudes with Parrot (1912-17) commanded $5,250. Fine sculptures achieved consistently robust prices with a range of artists, media and styles. The star lot was a late 19th century Italian Carrara marble model of a Young Columbus by Giulio Monteverde; it found a new home for $35,000. An unusual pair of Regency painted terracotta vestal figures, with fittings for gas flames from the collection of Tom Buckley, made $18,750. A lovely carved marble bust of Madame Recamier, after the Chinard model, realized $4,000. A small contemporary bronze from the acclaimed Mexican-American life sculptor Robert Graham, entitled Gabrielle, modeled on volleyball champion Gabrielle Reece, changed hands for $5,500. The most unusual find of the day was an ancient Egyptian sarcophagus lid, previously in the collection of actor Larry Hagman. 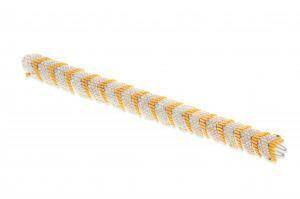 It far surpassed its preauction estimate to sell for $5,750. Andrew Jones Auctions’ next big auction, titled DTLA Collections & Estates, will feature 20th century design, fine art, accessories and books. The event will be held on Sunday, April 7th, also online and in the Los Angeles gallery, with a special uncatalogued, unreserved session filled with fresh estate property for local clientele only. Watch the website for details as auction day nears.